We are located on West Bay Street, 3 miles north east of the Nassau International Airport. 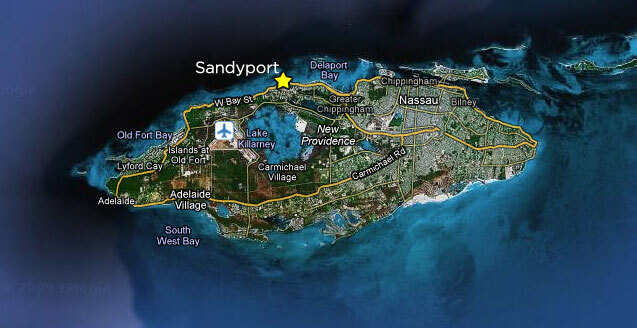 Taxis are readily available at Nassau International Airport to transport you to Sandyport Beaches Resort. The one way taxi rate for 2011 from the airport to the resort averages $18 for 2 people with each additional person costing $4. There are surcharges for extra luggage and also late night or early morning trips. Rental Cars are also readily available at Nassau International Airport. Exit the Nassau International airport and turn right (east) at the roundabout onto Windsor Road/ JF Kennedy Drive. In approx 1 mile turn Left onto Blake Road at the Statue of the White Crown Pigeon. Continue approx 1 mile to the fork and turn Right onto West Bay Street. Continue along West Bay Street past the Poop Deck at Sandyport, over the Sandyport Bridge then turn right into the Olde Towne at Sandyport. At the roundabout turn right into Sandyport Beaches Resort proceed past security to the Pink Reception building directly in front of you. There are currently no parking fees at the resort.